By John S. C. Abbott. The astonishing story of one of the leading women of the French Revolution—and of her own ironic but grisly end at the guillotine—is told with typical intensity and passion by master storyteller John Abbott in this gripping account of the events leading up to the infamous Reign of Terror. 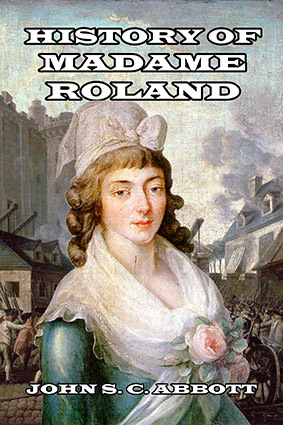 Marie-Jeanne Phlippon Roland, better known as Madame Roland, and her husband, Jean-Marie Roland de la Platière, were leading supporters of the initial ideals of equality and freedom which they presumed the French revolutionaries sought. As such, they became the leaders of what was known as the Girondist faction during those tumultuous events. The Girondists campaigned for the end of the monarchy but then found themselves at odds with the increasing violence and extremist nature of the radicals. Madame Roland began her political involvement as secretary to her husband, who was appointed minister of the interior of the government of 1792. This was a particularly dangerous post to occupy, as the radicals, still waiting to finally dispose of the French king, viewed the ministry as representing the crown, even though Madame Roland—and her husband—actively worked to persuade the king to accept the demands of the revolutionaries. Her June 1792 letter to the king, which urged him to publicly pledge his loyalty and cooperation to the new republic or face serious unrest, led to her husband’s dismissal as minister. Then, as she and her husband publicly opposed the worst excesses of the ongoing Revolution, the couple became equally unpopular with the revolutionaries as well, who now regarded them as conservatives. John S. C. Abbott (1805–1877) was an American historian, pastor, and writer. He and his brother, Jacob, were some of the most prolific popular history writers of their era, and together produced dozens of works for their New York City based Abbott’s Institute of Historical Biographies. Although trained as a theologian, John’s success a writer—which closely matched that of his brother—meant that he devoted most of his life to the written word.